As a huge fan of the Millennium Series by Stieg Larsson, I was very excited to read The Girl in the Spider’s Web by David Lagercrantz. This fourth book didn’t turn out to be as good as the original three, but I didn’t really expect it to be with a different author. Either way, I was happy to see some of my favorite mystery novel characters come back in a new story! In The Girl in the Spider’s Web, trouble strikes again for Mikael Blomkvist when his magazine starts to go downhill and another mysterious case lands in his lap. When it turns out that Lisbeth Salander, his previous partner of sorts, is involved in the case already, he decides to take it on. Once again, Blomkvist and Lisbeth work together to unearth an entire series of crimes that hide just below the surface. Through this book we get more insight into Lisbeth’s background and her very troubled childhood. She is a very interesting character whose good intentions hide behind her tough exterior. She is a defender of women and children and I can’t help but root for her. She might just be one of my favorite characters because she is so intelligent (her computer hacking skills are beyond anything I can comprehend) and simultaneously such a badass (in a good way). Unfortunately, there wasn’t as much character interaction and depth as in the first three. For example, while the first three had me gripping the books in anticipation, I wasn’t quite as engaged in this one. It’s also shorter than the original books; which may have had something to do with it. 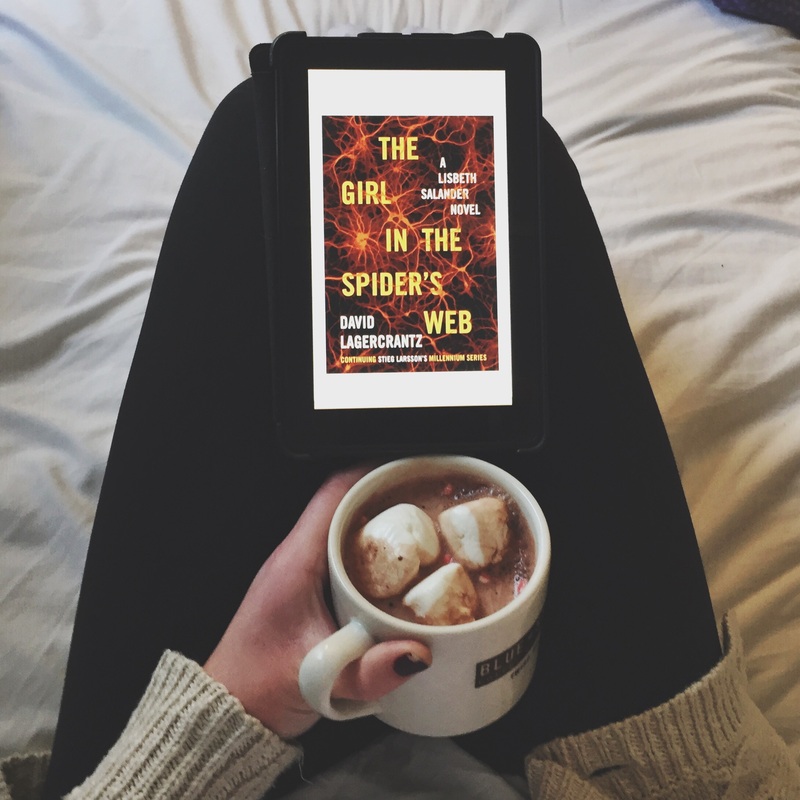 While it didn’t hit the same mark as the original three, The Girl in the Spider’s Web a good book and I’m always happy to read a lively mystery novel. I like how authors are more willing to sort of jump onto each other’s plot lines/ story lines now, sort of like with comic books… It’s fun to keep the story going, too bad thus one didn’t quite live up to the others. Nice review! It’s definitely a good book! The first three just set a very high expectation for me. You’re right though, it’s very interesting that this trend of writers jumping into other’s stories is becoming popular. I think I might pass on this one, loved the first three and was hoping they’d release his unfinished fourth. This being said, I might end up with a copy once it hits the remainder shelves. I’m currently reading it now! I was so excited to hear that there would be another novel! These novels are so good. I agree (although I’m only about 100 pages in) that it’s definitely a little different and not as gripping, I still love reading about Blomkvist and Salander! I was too! I was so glad to read another book about Blomkvist and Salander, even if it wasn’t the same as the first 3!